How many times can you revisit the Harry Potter stories before you're like, "Ugh, okay, we get it with the magic and the broomsticks already". If your answer was "never ever, ever" then you deserve a little more Harry Potter in your life. And while we get your need to keep compulsively checking your front door, your mail slot, even your chimney for that white letter from Hogwarts, we think you ought to move on and get yourself a Gryffindor school uniform! That's right, you don't have to wait around for an invitation to Platform9 3/4, show those headmasters you mean business by looking like a student of magical arts before you even get to the grounds! You don't need a sorting hat to tell you which house you belong to. Courage, bravery, and determination all sound like they're right up your alley. So, do Hermione proud and toss this Gryffindor tie on whether you're dressing up in full Hogwarts regalia or you're simply dressing in a business professional manner in the muggle world. 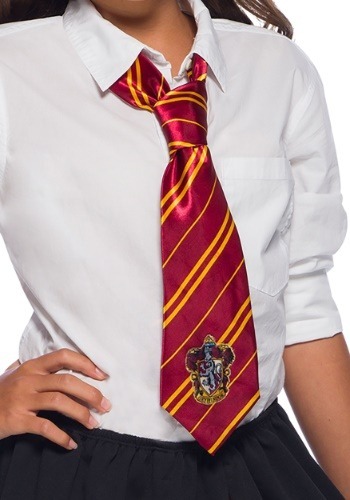 The maroon and gold stripes are eye-catching and just in case people don't recognize the Gryffindor colors immediately, the tie is topped off with a Gryffindor shield. So, if you're heading off to learn magic at a boarding school, it's important to not look like some muggle who's stepped out of their element. You've got to know the wardrobe. You probably know all about the robe but make sure you're ready to stay in a cold drafty castle and layer your house sweater underneath! 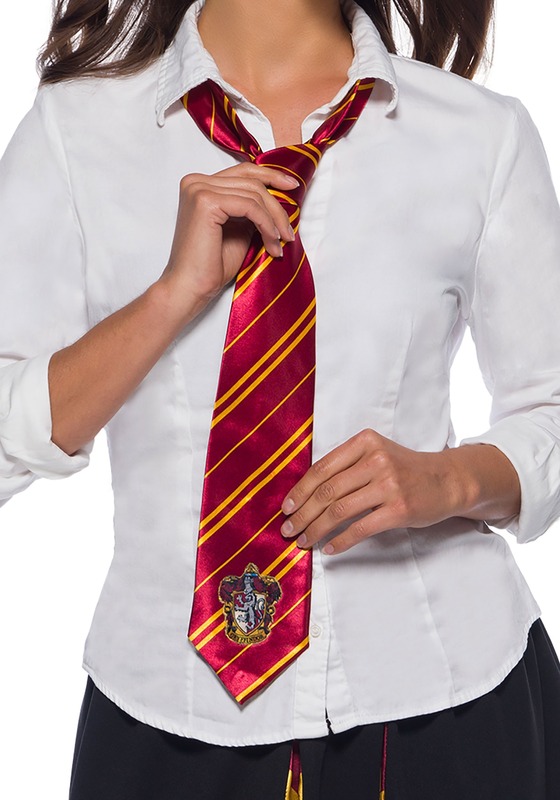 It looks smart with this tie whether you're wearing the house theme pleated skirt preferred by witches or the slacks worn by Harry and Ron. So throw it to let those headmasters know they better hurry up with that acceptance letter.